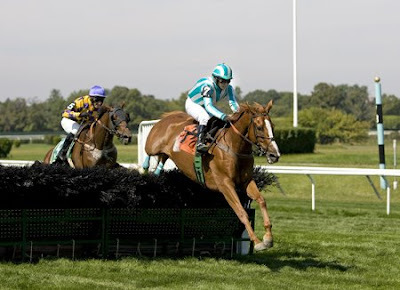 Defending steeplechase Eclipse Award winner Good Night Shirt took another step toward a repeat with a powerful score in the $150,000 Lonesome Glory Stakes (Gr. I) at Belmont Park Sunday. 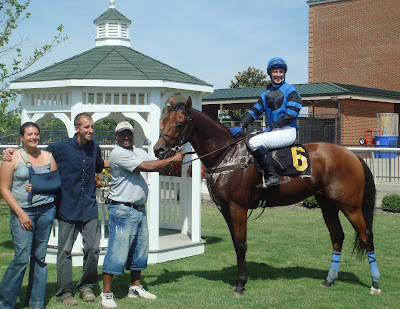 For the first time ever, both breeds of horsemen came together at Colonial Downs last Tuesday night as thoroughbred trainers joined their harness counterparts in sulkies to compete in a quarter-mile dash. 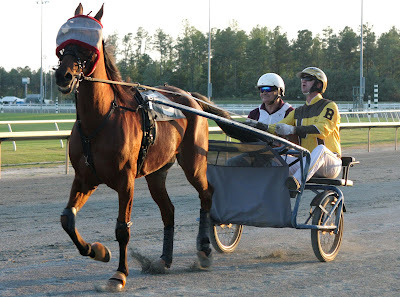 The Thoroughbred celebrities got to ride in the sulky with a licensed trainer and (according to various sources) were supposed to have thier hands on the reins during the contest. 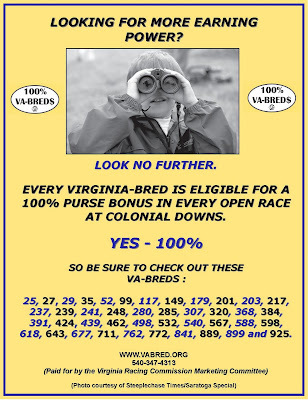 Longtime Virginia owner/trainer Randy Rouse sent One Sea out to a victory in a $15,000 optional claiming hurdle, the feature of a two-race steeplechase visit to Colonial Downs Sunday, September 14. Ridden by Roderick Mackenzie, One Sea defeated Sussex County and Gigger in the race, restricted to non-winners of $9,100 once or horses who started for a $15,000 claiming price). 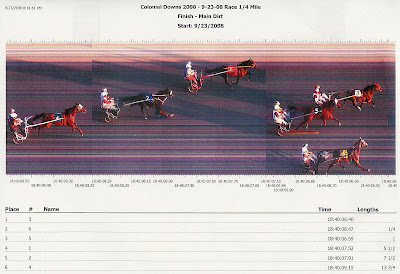 The winner started for the tag, as did most of the field. Here, ridden by Robby Albarado, he captures The Jockey Club Gold Cup Invitational at Belmont Park Saturday, Sept. 27, 2008 in Elmont, N.Y.
Curlin became the first horse in North America to top $10 million in career earnings, winning the $750,000 Jockey Club Gold Cup Gr. 1. 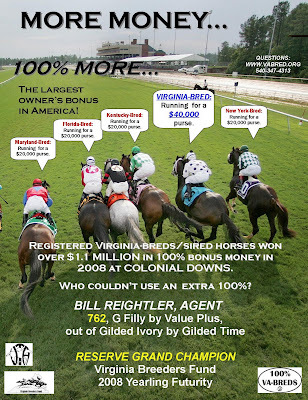 Everything came together at once for 2007 Virginia Derby Gr. 2 winner Red Giant in the $250,000 Clement Hirsch Turf Championship. 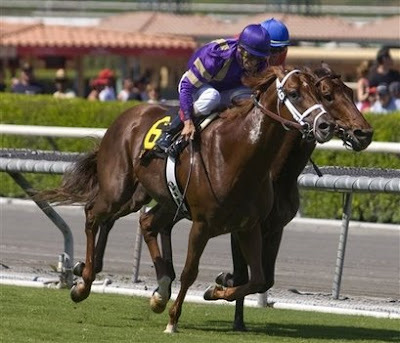 He set a world record of 1:57.16 for 1 1/4 miles on turf, won the first Grade 1 race of his 12-race career, and left John Fort of Peachtree Stable planning for a start in a Breeders’ Cup race here Oct. 25. Yes, it’s truly unique — the only sanctioned beach racing in Europe. Here, the field charges down the course in the third race at the Laytown beach racetrack on September 11, 2008 in Laytown, Ireland. 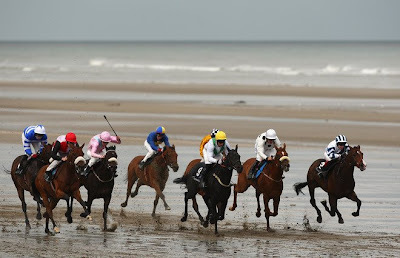 The Laytown racecourse is located at a small seaside resort on the east coast of Ireland, 29 miles north of Dublin. It is a most unusual course as it is a beach course run on the sand. 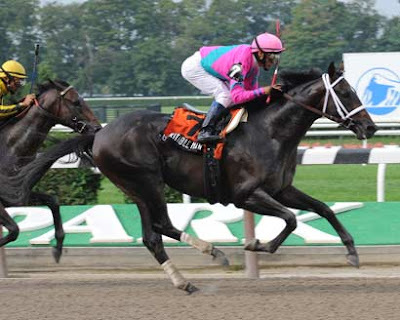 Virginia-bred Charitable Man swept into contention with a five-wide bid on the turn, seized command with one furlong to run, and edged clear to win the $250,000 Futurity Stakes (G2) on Saturday at Belmont Park. Edward P. Evans bred Charitable Man in Virginia. The $200,000 Keeneland September yearling is out of the stakes-winning Saint Ballado mare Charitabledonation.